The photo shows a court room where peaceful protesters and activists are standing trial, in Tehran's Revolutionary Court, Iran, Aug. 25, 2009. Iran’s Chief Justice Sadeq Amoli Larijani claimed that there are no political prisoners in Iran. 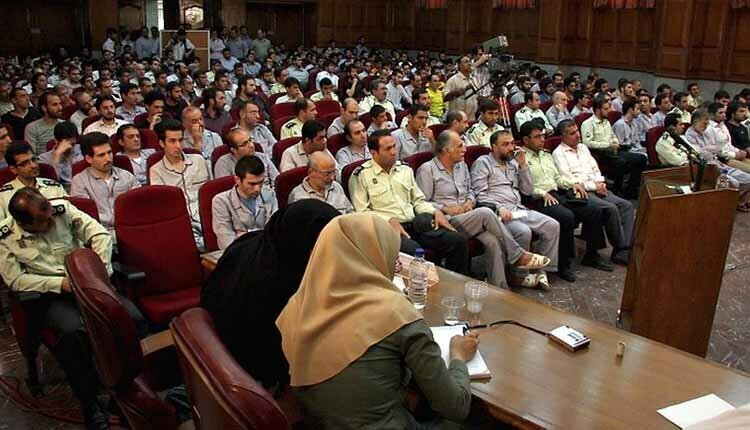 Amoli Larijani made the claim on Monday February 4 during a meeting with senior judicial officials in Tehran while announcing that 50,000 prisoners would receive “amnesty” on the occasion of the 40th anniversary of the Iranian regime. He said at the meeting on Monday that “acting against security is different from political offenses defined in the law,” adding that these are two different offenses ,and different legal procedures apply to those who are accused of such offenses. “Some people talk about releasing political prisoners or dissidents to marginalize this great measure. We do not have any criminals categorized as political prisoners. If someone acted against national security, this is an independent criminal offense that has to be addressed. Political crimes have been defined in the law and seeing to these crimes has its own legal procedures,” Larijani added in comments carried by the state-run ISNA news agency. Responding to calls for pardoning political prisoners, Amoli Larijani said: “Unfortunately some people who have positions in executive bodies have said that the amnesty incorporate critics (of the regime). It seems that they are indicating that there are people in prison only for criticizing (the regime). What a big lie this is. Is there anyone in prison today for criticizing (the state)? The judiciary has never prosecuted anyone only for criticism. These remarks stem from a lack of attention to the fact that libel and insults are different from criticism and lawmakers have also distinguished between the two. We say explicitly that criticism is not at all a crime in the Islamic Republic,” the cleric said. This is while lists of thousands of Iranian political prisoners and prisoners of conscience have been published by human rights organizations during and before Amoli Larijani’s stint as Judiciary Chief. Iran’s Judiciary even summonses members of the parliament regardless of their immunity, for making critical comments.